Sage 50 accounting software is a renowned and amazing software in the present day. It was published by Sage Group. It is mainly designed for growing and medium sized business houses. It is very helpful to manage business accounts. It will simplify the accounting as well as help in managing the Account Payable, Accounts Receivables. 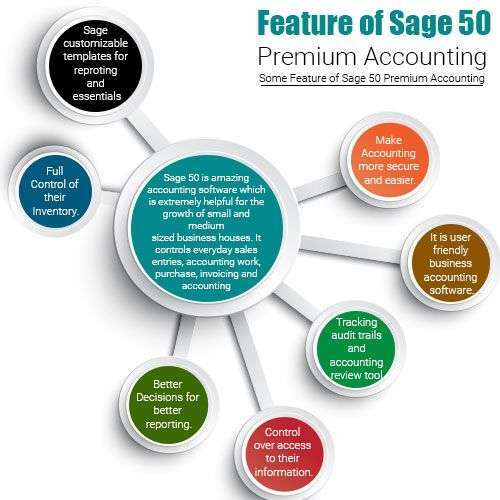 Feature of Sage 50 Premium Accounting software offers stronger Sage job costing, more inventory features and multiple users. Sage 50 Premium accounting software saves money and time by making simple task more efficient and productive. It provides the user complete information they need to make successful and secure business decisions. It gives the user one of the best services. Multi User: It can be licensed for up to 5 users. Security: It offers the control needed by multiple users at the same time. If they have more than one company permission, they are set free in each company. Open Multiple Companies: The user can open many companies at the same time. Customer Management Center: The user can access to their customer data with customizable screen. They can hide, show, or they can rearrange it to fit their requirements Feature of Sage 50 Premium Accounting. For example: Contacts, sales orders, invoices, Aged receivables, item sales history and top client over the last 12 months. Invoice Broadcast: They can send invoices to as many clients as they need. Strong Job Costing: It can be divided into many phases. These phases can break down into job cost for reporting. Change Order Processing: They can record receiving of the change order and apply the changes to the job’s operating expense, probable quantity and revenues. Services & Inventory Management Center: It quickly views their current status and all transactions for a selected inventory product (non-stock or stock). Serialized Inventory: They can expanse the inventory capabilities to include inventory with serial number. 10 Price Levels and Pricing Formulas. Sub- stock and Master items: It automates the complete process of creating related inventory products. Vendor Management Center: It also gives them easy access to their vendor data. Payroll time card entry: They can view time card entry on a weekly basis. Payroll raises history: They can track each user raise history. Sage 50 Intelligence Reporting: They can design report templates in excel. It is very helpful for inventory analysis, purchases, multiple balance sheets, a dashboard and income statement formats. At any time, the user can contact us on our Sage 50 Solutions. They can call us on our toll free number 1844-313-4856 for any assistance. If the user wants to chat with us, they can chat with us on the Sage online chat support.